The tables are presented in two formats to make attributing the tokens easier. These token dies are designated by Fuld numbers. Since two dies are used for each token, then two Fuld numbers must be used to identify a specific token. 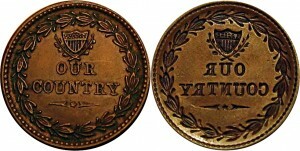 For example, the following token is made up of dies: 191 and 443. This would result in a Fuld designation of F-191/443. 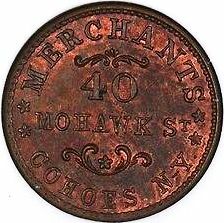 The token is also made of copper. One or two letters are used to designate what metal is used for the token. 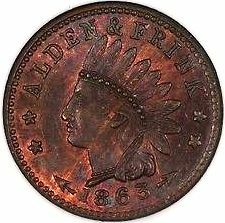 For copper, the letter ‘a’ is used by appending the Fuld designation: F-191/443a. This becomes the number found on NGC and ANACS holders and allows you to search for a specific token. The original system was created by Hetrich & Guttag, or H&G Numbers. These are seldom used anymore and this website will steer clear of them. The obverse number indicates the token’s state of origin by a two letter abbreviation like the postal system. This is followed by a two or three digit number indicating the city of origin for the token. Finally, one or two letters of the alphabet follow the city code to indicate which die from this city was used for the obverse. The reverse number is a sequential number indicating which reverse die was used for this obverse die. This number is follow by the material composition letter in lowercase. 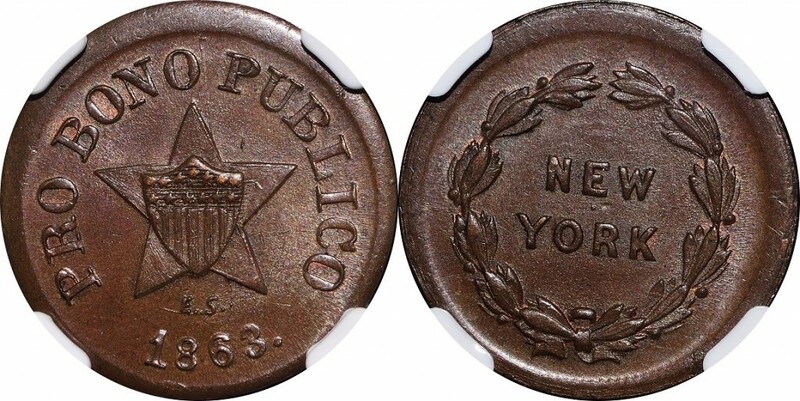 Example: NY 630K-1a would indicate the token was made in New York, City using die ‘K’ for the obverse and die 1 for the reverse. The token is made of copper as indicated by the ending lowercase ‘a’. This is currently the system also used by the Third Party Graders and will be used for Store Card identification throughout this website. 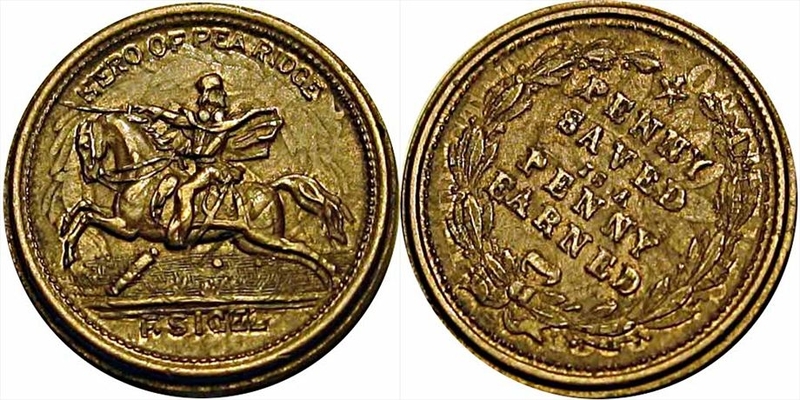 Since these tokens were not made by the US Mint, quality of workmanship was not always the best. Almost every token will have some type of “mint error”. But, there are a few which really stand out. These are the ‘Overstrike’, the ‘Incuse’, and the ‘Double-strike’. 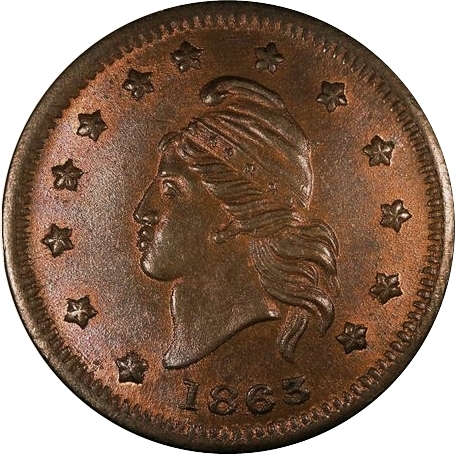 The ‘Overstrike’ occurs when the token is struck on a non-standard planchet, such as: an Indian Head Cent, a US dime, or even another token. The ‘Incuse’ is a full brockage. A condition where a token sticks to the hammer die. 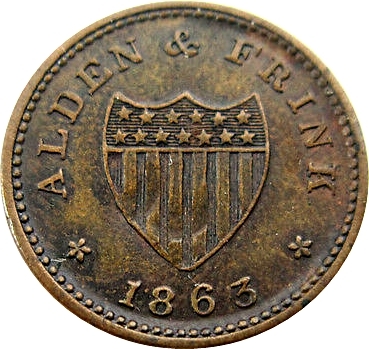 This stuck token has an image from the anvil die exposed and when it strikes the next token planchet, it imprints that image as an incuse, but reversed, strike on the obverse side of the token. 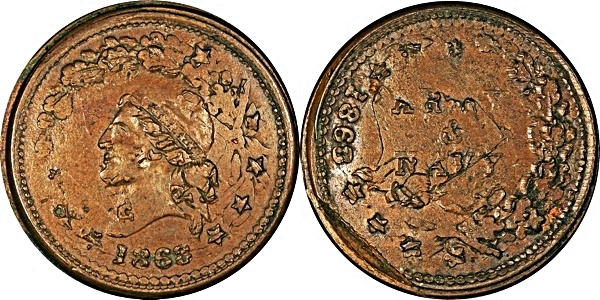 The ‘Double-strike’ is normally only considered if the token significantly rotated, or flipped over after the first strike and then was struck a second time. Our private minters are not to picky about the outcome of their tokens, so they fix the problem and throw the newly minted token into the pile. These significant ‘mint errors’ are extremely rare. Below each die listed are identifiers which make the die unique. While some of these identifiers are common to other dies, when considered with the possible combination dies, they become positive identification for the die. The boxed table below each die indicates the possible combinations. This tells you that die F-6 has only been found combined with dies: 6 and 268. The table also tells you the material composition and rarity of each combination. And, note that the combination with die 6 is an ‘Incuse’ error. Sometimes, the same reverse is used with slightly different obverse dies. The differences will be indicated under the obverse die. Above each reverse die table are the New Fuld numbers (New), and if applicable, the associated Patriotic (Pat) Die Fuld numbers. This gives you the ability to look up an image of the reverse die from a consolidated list of images. The reverse dies are consolidated so they only have to be shown once, as they are used frequently in other combinations. Some tokens have not been assigned New Fuld numbers. For these, if available, an image of the reverse die will be shown below the obverse die. Where possible, an example token picture has been provided. Due to the rarity of some of these, I have not found them all. If a picture has not been provided, then a description or the text on the die will be given. The collectible value of the token is determined mainly by its rarity and whether it has been authenticated. Expect to pay four times the raw value, or more, for an authenticated token. 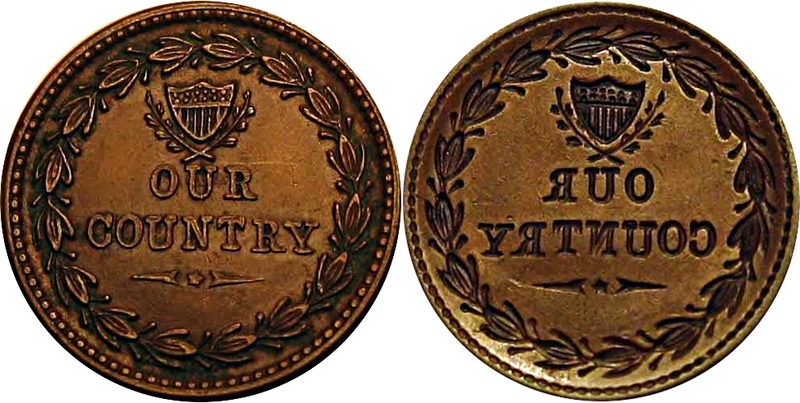 See Pricing Civil War Tokens.